I know I’ve already written about it, but recently our customers have given us so many rave reviews of Play at Height, Dingle’s climbing wall, that I thought I’d give them another plug. Given that the forecast for the weekend is not good, it’s a great option for active entertainment in Dingle on a wet day and a great way to let kids let off steam. Since we’ve introduced waffles into our shops, we’ve been offering cake less often. 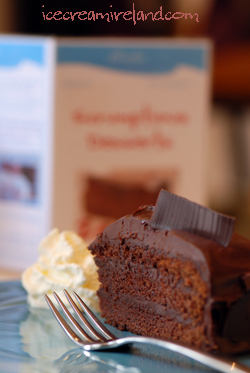 However, in the days when we were selling lots of cake, Wiebke’s Fudge Cake was our best selling chocolate cake, and we still have it from time to time. Its appeal is broad enough that you can serve it to grown-ups at any special occasion and be sure that it will go down a storm. For events with lots of smaller kids you could serve it cut in to little finger size pieces. 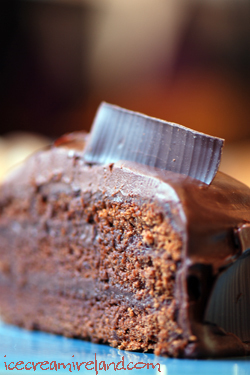 If you know that all of the people eating the cake prefer dark chocolate, simply substitute the 50% for 70% and satisfy those chocolate cravings! It is perfect with vanilla ice cream. This recipe was adapted by Wiebke (my brother’s wife) from a recipe from The Joy of Cooking. 1. Place the chocolate in a double boiler to melt. 2. Put the butter and sugar in the mixer and begin to mix. 3. Add eggs one by one by breaking into a plastic jug first and then adding to mixer. 4. Scrape the mix from the sides and bottom of mixing bowl. 6. Add the fully melted chocolate. 8. Combine flour and soda and sieve carefully. 9. Add ? of flour/soda and 125mls of buttermilk to the mix and mix on slow speed. 10. Add the next ? of flour/soda and final 125mls of buttermilk. Mix. 11. Add final ? of flour/soda and mix well. 12. Add 3 drops of “Massey” Vanilla. 13. With the dough now well mixed add 150mls of boiling water and continue mixing. 14. Grease and then lightly flour the bottom and sides of the baking pan. 15. Pour the dough mix into the baking pan. 16. Bake in preheated oven @ 180 °C x 45 minutes. 17. Remove baked cake from oven and flip upside down. 18. Leave to cool on cooling rack for at least 2-3 hours. 19. Melt 60 g butter in a double boiler. 21. Warm the cream in a saucepan. 22. Stir the warm cream into the melted chocolate, and keep stirring until smooth. 23. Carefully cut the cake horizontally twice, to make 3 layers. Cut into two if you have to. 24. Add the fudge sauce between the layers and on top. 25. Coat the fudge around the sides. 26. Decorate with chocolate shavings. Note: I must admit I haven’t made this cake (leaving it to the expert always seemed a good idea to me! ), so if you make it any feedback would be doubly welcome. 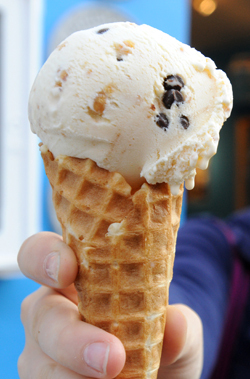 For those of you with a penchant for ice cream (and I’m assuming, given this site, that’s most of you!) 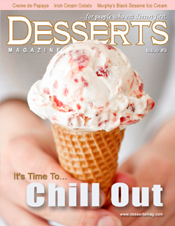 you might wish to check out the current issue of Desserts Magazine. I’m not just saying that because they have a full three spreads on us (here), including the black sesame and Irish whiskey recipes, but they have loads of interesting ideas, including a sassafras ice cream rootbeer float, a caramel ice cream Guinness float, a “Sunset Sorbet” which sounds divine: prickly pear and tequila are the prime ingredients, and even ice cream sushi! Anyway, if you want to make our vanilla ice cream, the recipe is here, and I promise there is no glucose or invert sugar!!! There are some who think working in a shop is a poor profession, but I have to say that the hours I manage to spend in our own shops are some of the best hours of my week. It might seem obvious, but we wouldn’t exist without our customers, and it’s good to constantly come back to that fact. It is they who keep us in business, pay our salaries, make the place lively, and decide by their purchasing decisions and suggestions what it is that we do. 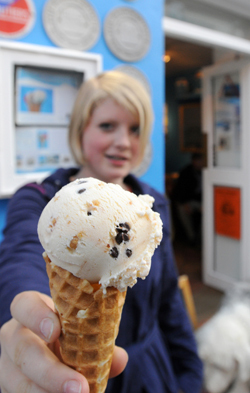 Making our ice cream would be meaningless without people to enjoy it, and their enjoyment creates such a buzz for me. There is a social aspect as well, as one has the opportunity to meet so many new people. In just one example, this morning, I spent an hour or so talking to the food editor of the Vegetarian Times (photo above), a woman who loves music, loves food, lives in Brittany, and has a wealth of interesting viewpoints and information. With people like her involved, no wonder that publication has such fanatical supporters. 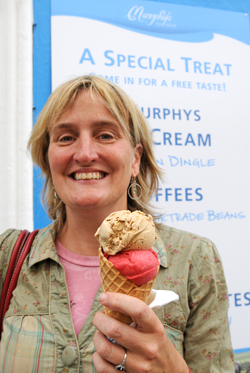 Last night, I wandered into our Dingle shop for an ice cream with my partner and the baby, and we had so much fun talking two sets of customers, both of whom remembered us when we first opened in 2000, that our walk went by the wayside (not that anyone, even the baby, minded that much). In these times, when there’s so much financial gloom and negativity about the place, there is no tonic like spending time with customers – seeing things through their eyes, listening to their feedback on what we do, and remembering, through their joy with the ice cream, why we started this business in the first place. Today I had to go out to our shop at Tig Aine in Graig, which is between Dún Chaoin and Ballyferriter on Slea Head Drive. 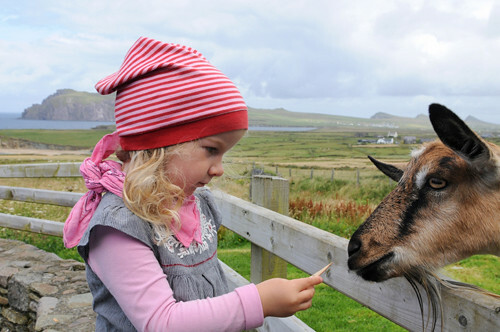 I brought my little niece Una, since she is quite enamoured with the animals about the place. 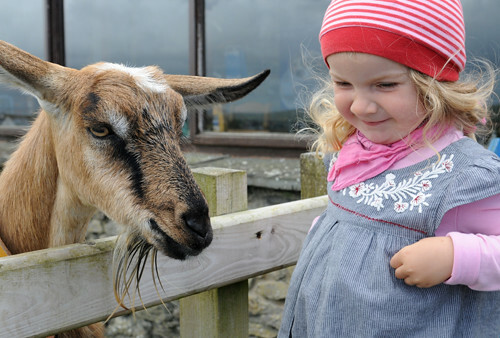 Aine, the owner of the premises, has ducks, chickens and a goat, and it’s the goat that really makes Una excited. Up until now, she was a bit nervous of it, but today she made friends by feeding it the teddy wafer from her ice cream cone. Today, we had to go to Tralee to pick up a few bits and pieces for the baby, and we stopped in for lunch at the Kingdom Food & Wine Store in Oakpark. Anyone in Tralee feeling peckish or looking for some interesting food products should check it out. 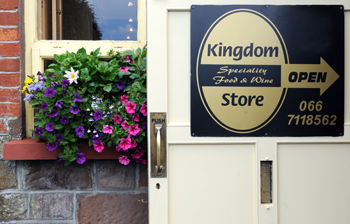 They have a great range of gourmet foods, an impressive selection of wines, and delicious sandwiches and other goodies. 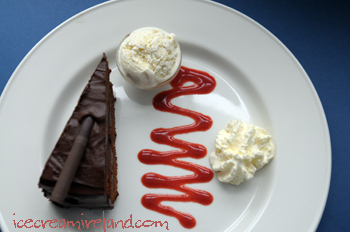 It’s on the Listowel Road and within easy walking distance to the bus/train station, so stop in if you’re heading on a trip! 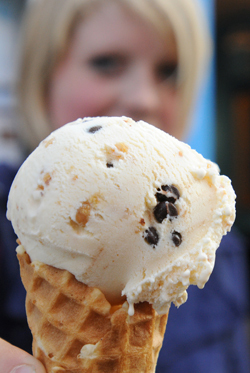 Here’s a flavour we have brought in to the shops for the summer, and it’s really gone down a storm. We’re replaced praline for the moment, and so far no one is complaining. Instead, this is becoming one of our summer hit flavours. It’s an easy enough ice cream to make, since all you need, besides the custard, is a bit of peanut butter and some chocolate chips. • 75 g dark chocolate chips. 1. Add the egg yolks and beat until thick. 8. Combine with the peanut butter (add mix to peanut butter is small amounts, stirring until completely combined). 2. People can have severe peanut allergies, so make sure anyone you serve it to is not allergic!